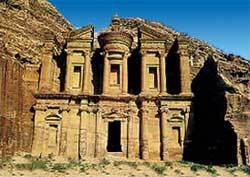 It is an ancient city of tombs, temples and other monumental buildings carved into solid sandstone cliffs in arid gorges in southern Jordan. They are the best seasons. Summer can be scorching and winter, blistery cold. It's a twisting gorge bounded closely on both sides by sheer cliff walls soaring about 200 meters (600 feet). At one point, the space between the towering walls narrows to just 5 meters (16 feet). Sometimes, the cliff walls come so close together that they block your view of the sky. This tight passageway provided the ancient Nabataeans with a natural defense for repelling invading enemies. The wavy sandstone geological strata give the facades and interior surfaces of the rock-hewn buildings interesting layered and whorled patterns - in a range of hues from pale yellowish white to intense desert rosy red. The Treasury building with its double-level colonnades is the favorite of most tourists. The cliff buildings of Petra were sculpted by the Nabataeans, an Arab tribe that flourished from around the 4th century BC to 106 AD, when the Romans took control. They were remarkable engineers who constructed a sophisticated pipe-and-tunnel water system to bring in drinking water and keep out flash floods.